I've mentioned before that I do not like to bake pies. I find them fussy (the rolling! ), and since I don't even like to eat pie, the effort is just not worth it to me. That said, I am ALL about cobblers, which I feel are definitely part of the pie-ish family sans the rolled out dough. The buttery, slightly cakey biscuit dough is easy to mix in a bowl and while it *can* be rolled out and cut into interesting shapes, that's totally not required. I prefer to just pluck out little clumps of dough and pat them right onto my fruit. In fact, what I love about cobblers is that they're totally carefree. They're supposed to be a little bit messy, with bobs of dough scattered on top and juices bubbling up and out the sides. It's lazy, casual, tough-to-mess-up food that still tastes incredible. That, my friends, is exactly my style! This version here is made with a mix of strawberries and blueberries, but would be great with just about any berry or stone fruit. And with any fruit recipes, keep in mind that the measurements are really just a starting point. What's MOST important, is that you taste your fruit and decide what it needs. Very sweet fruit? Feel free to cut down on the sugar and maybe add a little more lemon. Berries a bit too tart? Add a little extra sugar and maybe a bit of vanilla or almond extract. Citrus zest is always a lovely addition, as are spices like cinnamon, nutmeg or even allspice. 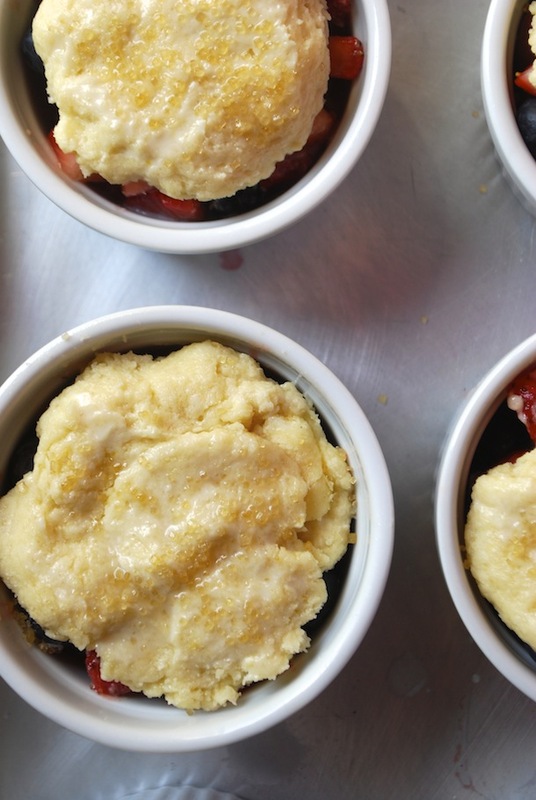 Or how about a berry chocolate chip cobbler? Play around. Get messy. Have fun. It's summer! Preheat oven to 400 degrees. In a large bowl, combine the prepared fruit, brown sugar, vanilla, lemon juice, and cornstarch. Stir to combine and set aside. In a separate bowl, whisk together the flour, sugar, lemon zest, baking powder and salt. Use a pastry cutter or your fingers to cut in the butter, working it in until the mixture resembles loose crumbs. Slowly pour in the buttermilk and stir until combined into a sticky dough. Brush the tops with milk and sprinkle with turbinado sugar. Bake 20-25 minutes, or until fruit bubbles and crust is puffed and golden brown. Let cool 10 minutes before serving. Serve hot or room temperature.